Creating and maintaining a safe environment is the highest priority at each and every CTA jobsite. CTA’s Safety Programs comply with the standards set forth by OSHA (Occupational Safety & Health Administration), the U.S. Army Corp of Engineers, and other federal and state agencies. 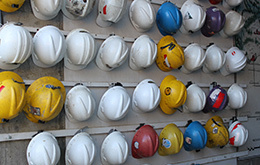 We develop job-specific safety programs for each of our construction projects. Our project team meets with key project constituents at the beginning of each project to review safety protocols and procedures, and develop and enforce site-specific safety plans. We review trade contractors’ safety programs to ensure that they meet CTA’s standards, and support and provide additional training to our field partners as needed. Mandatory weekly “toolbox” talks are held onsite at trade contractor meetings, and our project team conducts daily site safety reviews. We report and follow up on all potential and existing issues until they are resolved. As an added measure, CTA engages an independent safety consultant that makes frequent site inspections, site condition documentation, makes recommendations and reviews corrective actions. CTA is a responsible builder and it is our practice to confirm the U.S. work eligibility of our trade contractors’ employees on all of our projects. Upon presentation of documents (such as I-9s and W-4s) that demonstrate our subcontractors’ workers and evidence of Worker’s Compensation insurance coverage, our field staff are issued “badges” that they must present each day in order to work on our jobsites. Depending on the requirements of Owners, the badging program can further expand to include Criminal Offender Record Information (CORI) and other trade-specific safety certifications. CTA’s project executives, managers and superintendents hold Massachusetts Construction Supervisors Licenses and have OSHA 10-hour and 30-hour certifications, and are certified in specialized training such as fall protection, scaffolding, confined spaces, lull, scissor and boom lift safety. Our firm is recognized for our safety standards and has been the recipient of three Gold Level Safety Training and Evaluation Process (STEP) Awards from The Associated Builders and Contractors (ABC) of Massachusetts.